Area 1 is an area of Alaska located in the Southeast. Alaskans consider this area the gateway into Alaska and refer to it mainly as just “The Southeast.” This area of the state is perhaps one of the closest locations to the mainland part of the United States and can be reached without too much trouble. From the Northwest part of the United States a plane ride to this area of Alaska would only take two hours. Additionally, it is much cheaper to take a ferry to and from the same location in the northwest. A ferry ride to the Southeast would take no more than two days. Because of its accessibility the Southeast is a popular region for first timers to find summer employment. The Alaska Marine Highway System is the ferry system that runs in the Southeast and represents the primary way for tourists and locals to navigate the region. Because the region is made up of 250 smaller islands, traveling within the region is mainly done by ferry or plane. This is perhaps the main reason why the Alaska Marine Highway System was implemented. This region of Alaska is different from other parts of the state because of its temperate weather. The ocean waters are considerably warmer and even Alaskan winters seem more like a winter spent in Oregon or Washington. If you know anything about the region you know that it rains frequently due to the warmer weather. While this keeps the region flourishing with green fields, waterfalls and even some glaciers, the pay off is the liquid sunshine (or rain) that falls continually from the sky. The area is a popular summer employment spot for greenhorns and is a popular spot for the Alaska salmon fisheries. All five varieties of Pacific Salmon are harvested out of the Southeast. The state continually produces 30-45% of the total salmon harvest from the state each year, with catches ranging from 60 to 80 million annually. It goes without saying that all of that salmon requires harvesters and processors in order to be successful and it is in these jobs that so many summer workers are employed. The region sees salmon migrations arriving from the north of Alaska and begins around July and peaks heavily in August. In 2014, 83% of the salmon caught in the Southeast was caught from Purse Seiners. The trollers who work these waters usually catch better prices because the fish they catch are of higher quality. Thus, these boats target the Chinook, Coho and other high-end salmon varieties in the region. It can easily be said that the Southeast has cornered the market for halibut as well. 72% of the total halibut fishery for the 2014 season was taken out of the Southeast. 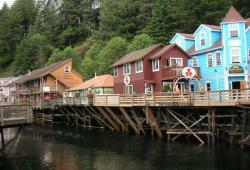 The cities that make up Alaska’s Southeast area are: Ketchikan, Petersburg, Wrangell, Sitka and Juneau.